GM started building saleable Bolts at its plant in Orion Township, Mich., in late October. It's building about 100 Bolts a day. DETROIT -- General Motors made its first U.S. sales of the Chevrolet Bolt EV on Tuesday, beginning a new era of more affordable, longer-range electric vehicles and fulfilling its promise to launch the vehicle before the end of 2016. The automaker also committed to making the Bolt available nationwide by mid-2017. Chevy dealerships in the San Francisco Bay Area made three Bolt deliveries Tuesday morning, GM said. The car is being distributed first to retailers in California and Oregon, two states that require automakers to sell a certain number of zero-emission vehicles and where EVs are in demand and buyers can receive generous incentives. In the first quarter of 2017, GM said, the Bolt will become available in New York, Virginia, Massachusetts and other parts of the Northeast and Mid-Atlantic region. It will then expand to additional “major metro markets” in the first half of the year before ultimately reaching EV-certified dealerships across the U.S. around midyear, GM said. “All of the hard work that the Chevrolet team have put into designing, engineering and building the Bolt EV brings us to this truly satisfying moment of making the first deliveries to customers on time, as planned,” Alan Batey, president of GM North America, said in a statement. GM Canada started taking orders for the Chevrolet Bolt EV on Dec. 9. Canadian versions will be initially available only in three provinces, as General Motors seeks to stoke demand by taking advantage of government rebates. The first deliveries to customers are expected in early 2017. The Bolt, with a starting price of US$37,495 including shipping, is the first EV offered in the United States with a range of more than 200 miles (322 kms) on one battery charge (its official EPA-estimated range is 238 miles, or 383 kms) and a price of less than US$40,000. Most buyers are eligible for a US$7,500 federal tax credit, effectively lowering the base model’s price to US$29,995. In Canada, the base price is Cdn $44,395, including shipping. General Motors claims that price can be as low as Cdn $33,034, including shipping, in Ontario, for example, if buyers take advantage of provincial pre-tax incentives totalling Cdn $11,361. Quebec and B.C. are the only other provinces to offer incentives. There are no federal incentives in Canada. The sooner Chevy can expand availability of the Bolt, the better chance it has to poach consumers from the huge wait list for the Tesla Model 3, which promises a similar range and price but is not yet on sale. Tesla has said the Model 3 will be available in late 2017, but Morgan Stanley analyst Adam Jonas said last week that he doesn’t expect it to launch until late 2018. That would give the Bolt a head start of more than a year and a half. Chevy didn’t formally take deposits or reservations for the Bolt, though many individual dealers have amassed lists of consumers who want to buy the car when it’s available. Tesla has said it collected US$1,000 deposits from more than 400,000 people who want a Model 3, though it has not provided an updated reservation count recently. Ford Motor Co. has said it also is developing an EV with a 200-mile (322-km) range, though it’s not expected to go on sale until 2019. 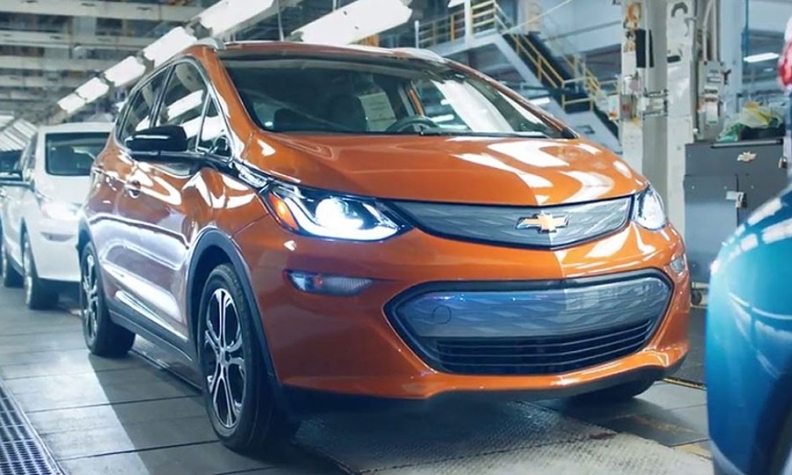 GM said the first Bolt buyers were a retired law enforcement officer who previously owned a Chevy Spark EV and a second-generation Chevy Volt plug-in hybrid; a software developer who is replacing a BMW i3; and a commercial real estate broker who is replacing a Toyota Prius. GM started building saleable Bolts at its plant in Orion Township, Mich., in late October. It’s building about 100 Bolts a day, based on figures provided during a media tour last week. The Bolt is built on the same assembly line as the Chevy Sonic subcompact car. GM hopes to eventually increase Bolt production significantly, and it has the capacity to do so at the Orion plant, which is operating on just one eight-hour shift a day. Automakers would prefer to run plants around the clock to be more efficient. “We want to be on three shifts, depending on market demand,” said Yves Dontigny, GM’s plant launch manager for the Bolt.